* Teachers are coworkers with students; children from many backgrounds can learn to write together. The text sythesizes what we know about how children learn, how we write, and what we write into a process of teaching children to write. 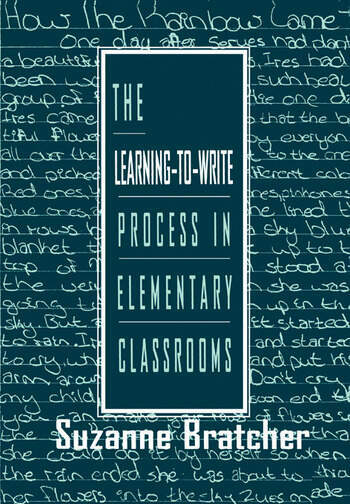 It is intended to serve as a starting place for developing theories of how to best teach writing. Contents: Preface. Part I: The Learning-to-Write Process. Learning to Write. Establishing Comfort. Building Confidence. Developing Competence. The Conventions of Writing. Part II: Reasons to Write. To Communicate. Telling Our Own Stories. Sharing Information. Trying to Change Things. For the Love of Writing. To Learn. Part III: The Teaching-Writing Process. Learning to Teach Writing. Teacher Evaluation of Student Writing. Tuning Teaching. Appendix: Quick Review of Editing Rules (For Teachers Only)! "There are many good language arts texts on the market but this is the first to include both teachers and students in the writing process....Bratcher doesn't tell teachers what to do--she models for them....Bratcher easily connects the processes of writing with theories from child development and socio-cognitive learning perspectives....The writing style is informal and reader-friendly....Bratcher writes from the heart--and from years of experience both as a writer and as a teacher of writing." "The contribution of this book is to orient readers toward a believable and achievable pedagogy....I congratulate Bratcher on her smoothness of integrating theory in ways that do not alienate or intimidate, but inform the reader....Bratcher's voice is clear, sincere, down-to-earth, and intelligent. Any teacher could find ideas to put into action." "Particularly good for new teachers....This text gives specific suggestions and has an excellent chapter at the end to help new teachers design their year-long curriculum."